The word Reiki comes from the Japanese word (rei) which means “universal life” and (ki) which means “energy”. Reiki stimulates a person's own natural healing abilities and is an excellent compliment to traditional medical therapies. It's a non-invasive form of energy healing that promotes relaxation and balance in mind, body, and spirit. A reiki treatment helps to balance energy in the body. It provides relaxation that can help you feel calm and peaceful, strengthen the immune system to promote health, reduce stress in the body and mind, and decrease physical pain in the body. Clients lay comfortably on a massage table (fully clothed). The practitioner places their hands on, or just above different locations on the body. During a session clients may feel physical sensations such as as warmth, cold, or slight tingling. Some clients experience emotional release, or even become so relaxed that they fall asleep. Each reiki session is unique. Clients usually leave feeling more relaxed, balanced, and with a greater sense of peace. Your reiki session always includes aromatherapy, if desired. Essential oils can work to cleanse, ground, lift, balance, and calm the central nervous system and the emotional body. I use therapeutic grade doTERRA essential oils to enhance reiki treatments. 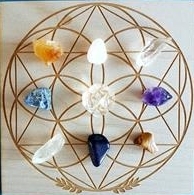 A reiki treatment may also incorporate crystals depending on your needs. Crystals heal holistically – they work on the physical, mental, emotional, and spiritual levels of being realigning subtle energies. They work through vibration. The singular or combined vibration of different crystals and stones affects our own vibration, so that we can positively impact our overall health and well-being, and change the circumstances we attract into our lives. Crystals have been used for their therapeutic purposes for over thousands of years. I am a Usui Reikimaster and Certified Crystal Healer practicing in Fort Saskatchewan, Alberta.